I’ve been kinda MIA in the last few weeks but I should be back to my usual schedule soon hopefully! 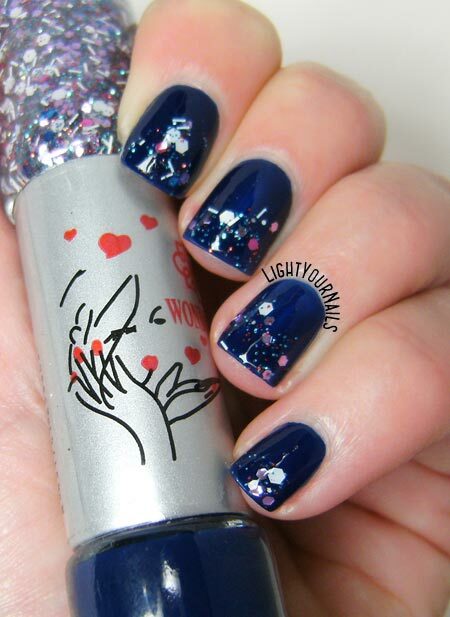 Today I’m showing you a nail art I created for the Nail Crazies Unite group and themed “Blue and white”. This colour combo always leads me to nautical manis but I wanted to do something different this time. I started with P2 High Five and I stamped over it with BP-103 stamping plate* from Bornprettystore and Sinful Colors Snow Me White. As usual you can find Bornpretty’s products on their German front store Nurbesten.de, too. I sealed my mani with a matte top coat. In queste settimane latito un po’, ma a breve dovrei tornare al solito sul blog! Oggi ho preparato una nail art per il gruppo Nail Crazies Unite a tema “Bianco e blu”. Questo accostamento di colori mi porta sempre a creare delle nail art a tema nautico ma oggi ho provato a fare qualcosa di diverso. Sono partita con lo smalto P2 High Five come base e ci ho stampato sopra un disegno di pizzo con il dischetto BP-103* di Bornprettystore e lo smalto Sinful Colors Snow Me White. Come sempre i dischetti di Bornpretty sono disponibili anche su Nurbesten.de se ve la cavate col tedesco. 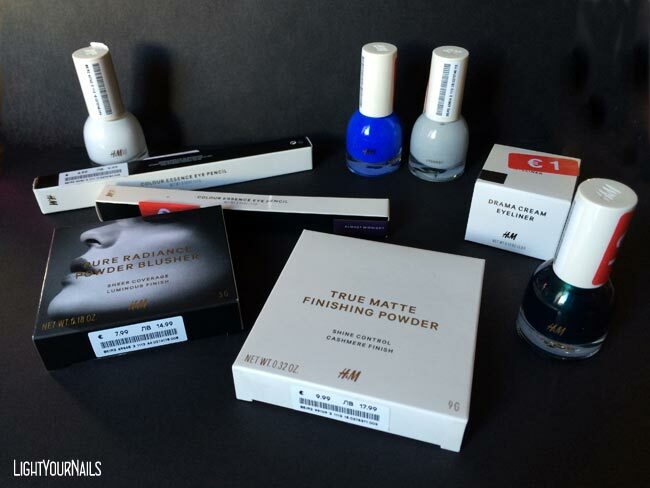 Ho sigillato la nail art col top coat Flash Mat di TNS Cosmetics. 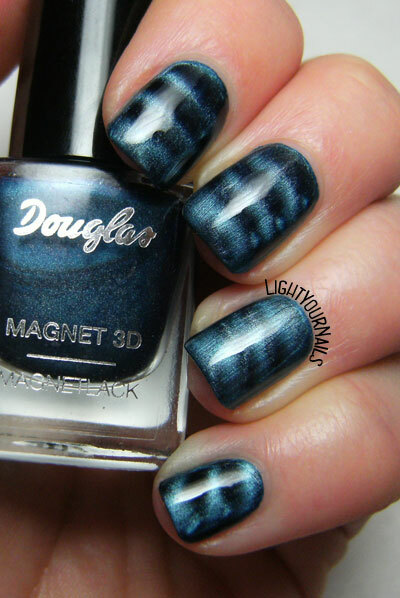 Maybe you are thinking that this nail art is a bit smudged. I must say that doesn’t bother me at all because it kinda adds movement to it, if it makes sense. I must add the smudging is my fault for pressing too hard with the stamper. The stamping plate itself works wonderfully and perfectly transfers all thin lines. I know because I’ve used this one before. I actually love this plate with the big lace pattern. Now I gotta go and I really hope you liked today’s mani. Let me know what you think of it! Forse la nail art vi sembrerà un po’ sbavata ma devo dire che non ne sono infastidita, anzi, mi sembra che ci sia più movimento. Aggiungo che la colpa delle sbavature di colore è mia che ho spinto troppo sul tampone. Il dischetto l’ho già usato e funziona perfettamente trasferendo le linee molto nitide. Lo trovo molto bello con questi ricami di pizzo in effetti. Ora vi lascio e spero che la manicure di oggi vi sia piaciuta. Fatemelo sapere! 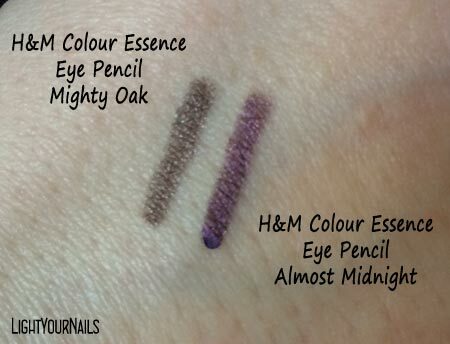 Today I am showing you swatches of H&M Stucco that I bought on sale at only 1€. It’s a light grey creme nail polish. 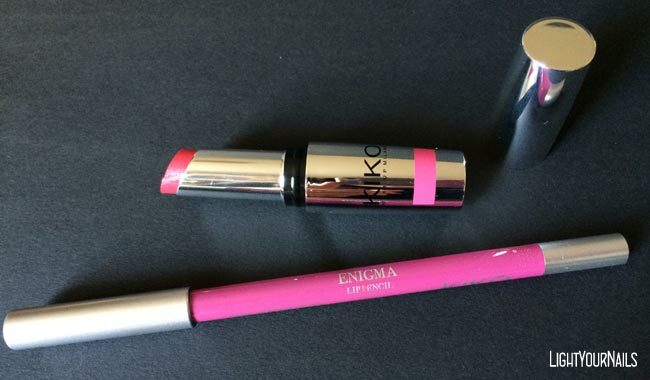 It’s very pigmented and application is super easy thanks to the rounded brush. Drying time is quite quick, too, and the finish is extremely glossy. Pics show two coats without top coat. 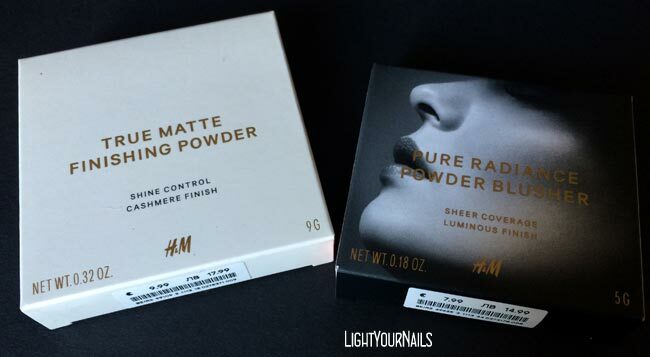 Oggi vi mostro lo smalto H&M Stucco comprato in saldo a 1€. Si tratta di una lacca color grigio chiaro dalla coprenza molto alta. La stesura è semplice ed è agevolata dal pennello con punta arrotondata. L’asciugatura è veloce e il finish molto lucido. 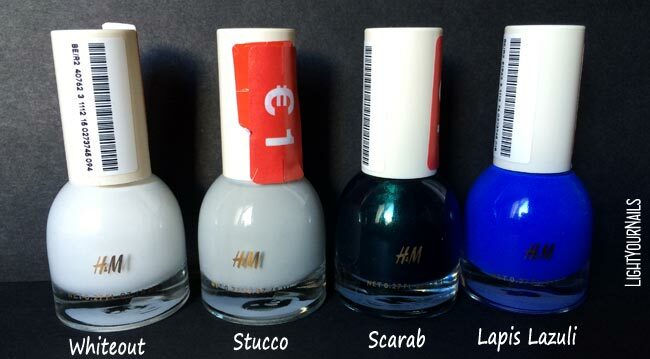 I must say these new nail polishes by H&M beauty are incredibly good and they are worth every cent of their price. That said, if you find them on sale be sure to stock up on them! Do you like grey nails? I love grey everything to be honest, it’s one of my favourite colours! Devo dire che questi nuovi smalti della linea beauty di H&M sono davvero ottimi e valgono decisamente il loro prezzo pieno. Se poi li trovate in saldo fatene scorta! Vi piace il grigio sulle unghie? Io sono un po’ di parte perchè è uno dei miei colori preferiti in generale! I’m back today with a nail art created for 30 Days of Colours Challenge group. This week’s theme is Pink. I started with Astra Expert Gel Effect 04 Danse as a base and I wanted to add some kind of lace on top of it. 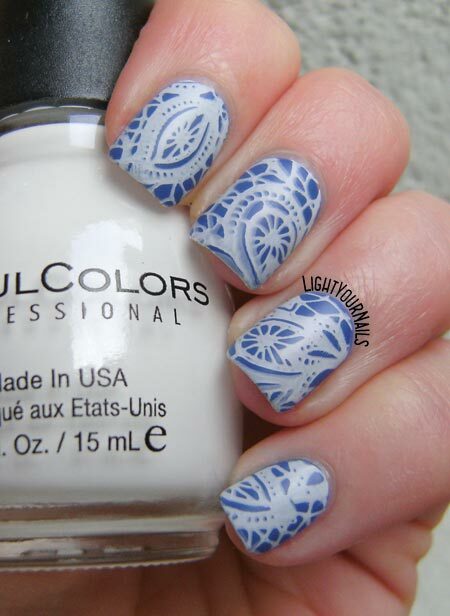 I used BP104 stamping plate* from Bornprettystore and Colour Alike 547 as a stamping polish. I sealed my mani with Essence Gel-Look Plumping top coat. In the last pic you can see the matte version, too, which has TNS Flash Mat top coat on top. Oggi sono di ritorno con una nail art creata per il gruppo 30 Days of Colour Challenge. Il tema di questa settimana è il rosa. Sono partita dallo smalto Astra Expert Gel Effect 04 Danse come base e ho deciso di stamparci sopra una specie di pizzo tono su tono. 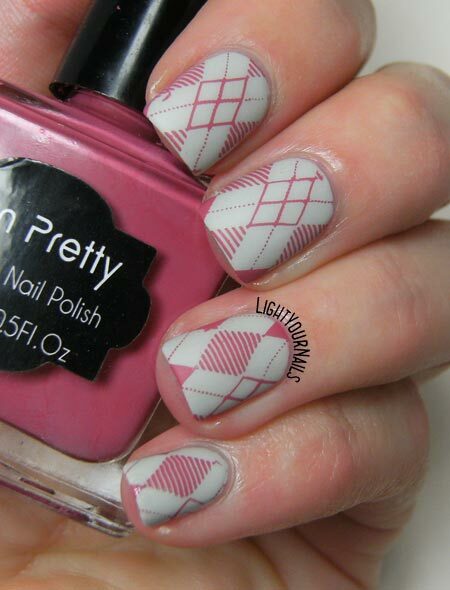 Per farlo ho utilizzato il dischetto BP104* di Bornprettystore e lo smalto Colour Alike 547. Ho sigillato tutto col top coat Gel-Look Plumping di Essence. Nell’ultima foto invece vedete la versione matte, ottenuta con il TNS Flash Mat top coat. I really like that the matte top coat didn’t hide that blue shimmer of the Colour Alike 547, but this time my favourite version is the glossy one. 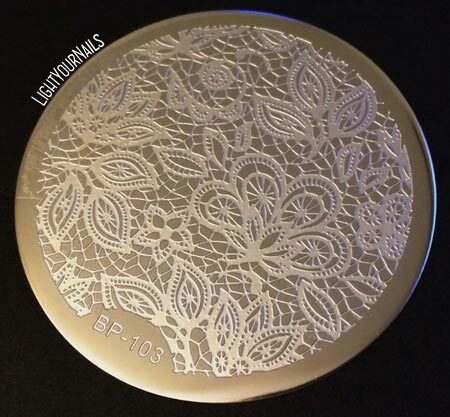 Regarding BP104 stamping plate* I think the photos say it all. 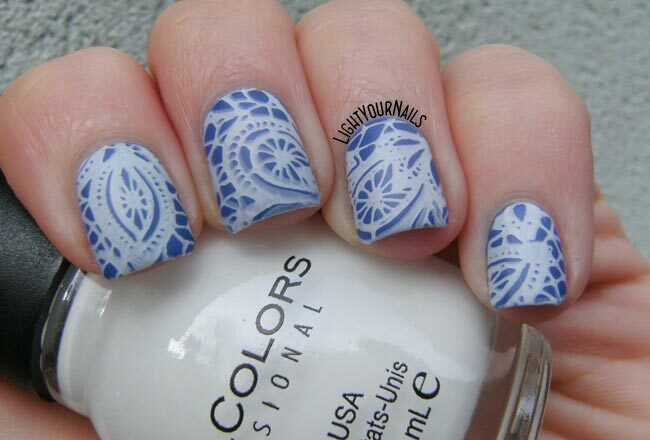 The lace pattern has very thin detals, plus I used no special stamping polish. Despite that the stamping was perfect. Very good plate! What do you think of this pink nail art? Do you like it or is it too subtle for your taste? 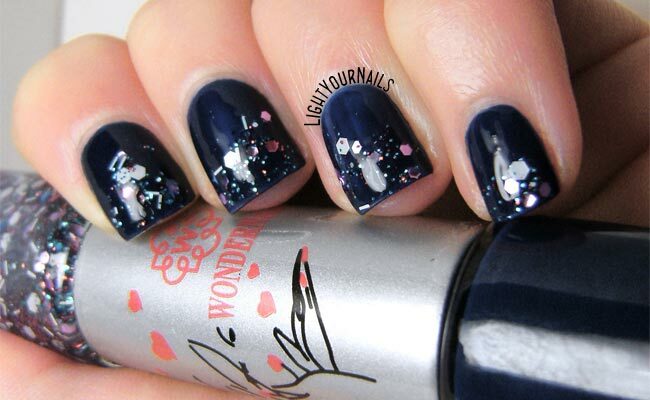 Mi piace che il top coat matte non abbia cancellato quello shimmer azzurro che ha lo smalto Colour Alike 547, però questa volta ho decisamente preferito la versione lucida di questa nail art. Per quanto riguarda il dischetto BP104* direi che le foto parlano da sole: il disegno del pizzo che ho utilizzato ha particolari molto sottili, inoltre io ho utilizzato uno smalto normalissimo, nemmeno tanto coprente. Nonostante questi due ostacoli la stampa è riuscita in modo perfetto! Dischetto promosso a pieni voti. Cosa ne pensate di questa nail art in rosa? Vi piace o è troppo poco visibile secondo voi? Yesterday it was the start of Winter sales in Italy so this morning I decided to go to the city center to visit Kiko and H&M and see if I could spot any good deal. I also stopped at the drugstore for some extra shopping. Oggi ho deciso di mostrarvi gli acquisti fatti questa mattina approfittando dei saldi. Il freddo si faceva sentire quindi ho fatto solo 2 tappe: Kiko e H&M. Mi sono anche fermata al Tigotà per alcuni acquisti non cosmetici, più un bonus. 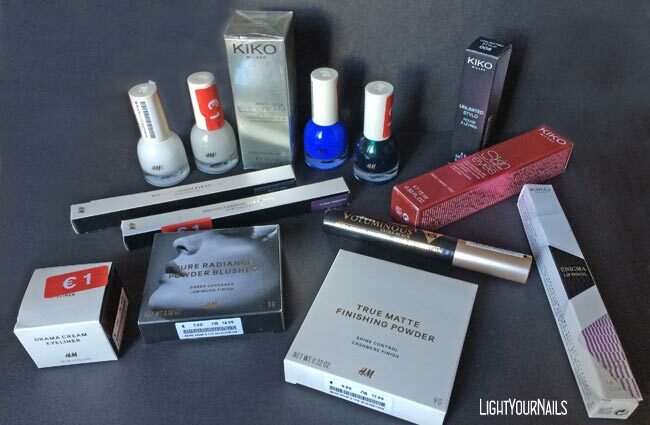 First stop was at Kiko. I didn’t buy much, when I go into the store I feel like I already own everything. Anyway I am running out of the eye contour cream I am currently using and that I am not excited about. 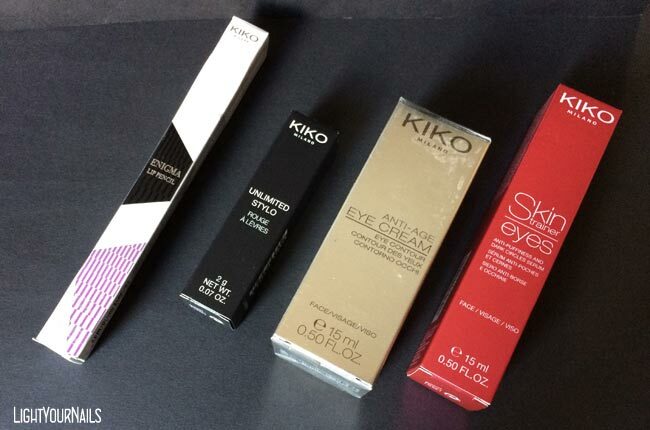 And I have never used any Kiko skin care product so why not taking advantage of the sales to try a few? I really like the Unlimited Stylo lipsticks I already own so when I saw this pretty metallic pink I just had to grab it. The lipstick is a purple leaning pink and have nothing quite like it. Prima tappa Kiko! Non ho preso molto, ormai quando entro nel negozio ho l’impressione di avere già tutto. 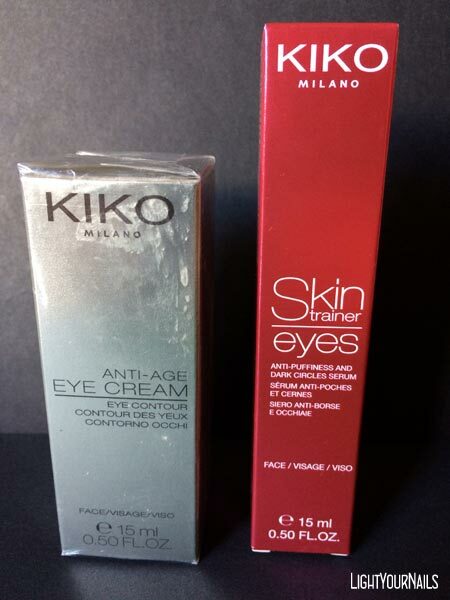 In ogni caso c’erano alcune creme contorno occhi in offerta, e io sto finendo quella aperta della Lavera che non mi ha entusiasmato. Perchè non provare le creme Kiko? Non credo di aver mai usato i loro prodotti skin care. I rossetti Unlimited Stylo che possiedo mi piacciono molto e questo rosa metallizzato mi è piaciuto subito. La matita è un color ciclamino e non ho niente del genere. Then I went to H&M which was the shop I was the most interested in. I love sales there so I can try some of their beauty products without spending a bunch of money. Unfortunately the eyeliner in the pot has completely dried out, although the product was still perfectly sealed. I won’t go back for changing it or for a refund because the fuel for the car would cost me more than 1€. Anyway it’s annoying. Poi sono andata da H&M, che era un po’ la mia tappa principale, coi saldi posso provare i loro prodotti senza sentirmi troppo in colpa. Purtroppo l’eyeliner è inutilizzabile, ho aperto la confezione (perfettamente sigillata) per fare le foto e il prodotto è completamente asciutto, un pezzo di cemento. Non tornerò a cambiarlo perchè spenderei più di benzina che l’euro che l’ho pagato, però ho pensato di avvisarvi. Before going home I also stopped at the drugstore to buy something else I needed. I am currently using a couple mascaras that are way too old by now and I had a 30% coupon on make-up so I also bought L’Oreal Voluminous Extra Black mascara, which is always a favourite. Infine sono passata da Tigotà per prendere altre cose che mi servivano in casa. Sul volantino di gennaio ci sono due buoni del 30% da usare su prodotti make-up; ho tre mascara aperti da troppo tempo ed è ora di buttarli, quindi ne ho approfittato e ho preso il mascara L’Oreal Voluminous Extra Black, uno dei miei preferiti (9,66€ invece di 13,80€). That’s some big haul but a girl needs some shopping every now and then right? Che spendacciona! Però ho comprato cose utili e cose carine e fa piacere a volte togliersi qualche voglia. Voi avete fatto danni? E cosa ne pensate dei miei? 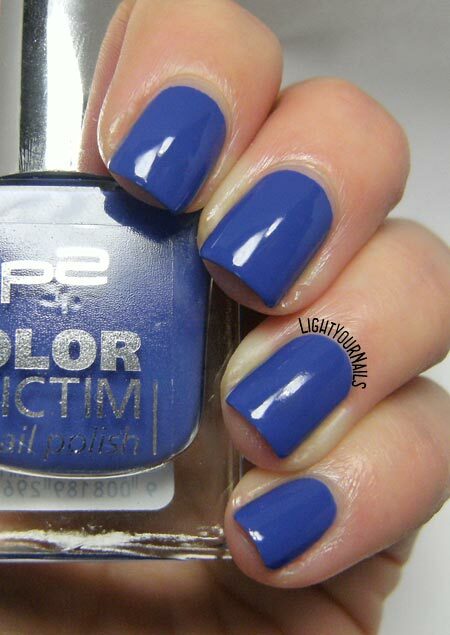 Today I’m showing you a double-ended nail polish by Bornprettystore. You might have seen this packaging around few times already. We have a creme nail polish on one side and a glitter top coat on the opposite side. Essence often uses this packaging for Trend Editions. 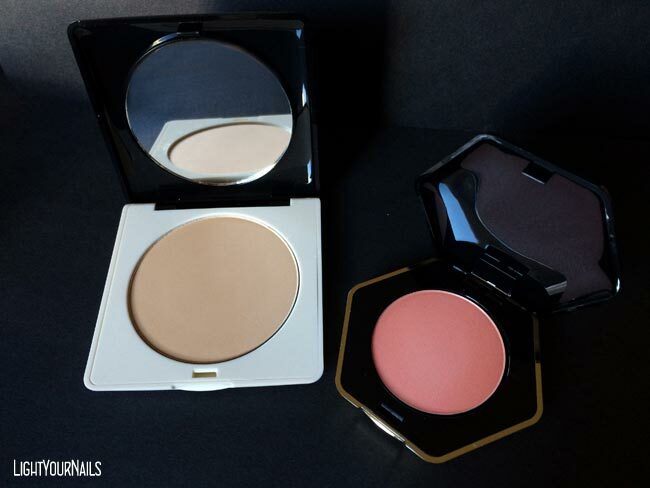 Revlon used to have a collection that had a white creme and a neon colour. The idea is quite good, but the bottle is so uncomfortable to use. But let’s get right into today’s nail polish: Bornpretty double ended glitter nail polish in no. 16. On one side we have a cobalt blue creme of poor quality. Application is not that bad but you just can’t avoid bald spots. It also dries matte which is of no help. Also, you gotta pay attention not to flood your cuticles because the colour is extremely pigmented and it’s a nightmare to clean it up. The glitter side is a top coat that you can layer on the whole nail or only on the base or the tips to get a glitter gradient. It’s made of hex glitters of two sizes, the bigger ones being white, the other ones being magenta, pink and blue. There’s also some white bar glitters and some very small red and blue glitters. They all come in a clear base. The colour mix is actually very pretty and the quality is much better than the creme. The glitters spread evenly and they lay flat on the nails. 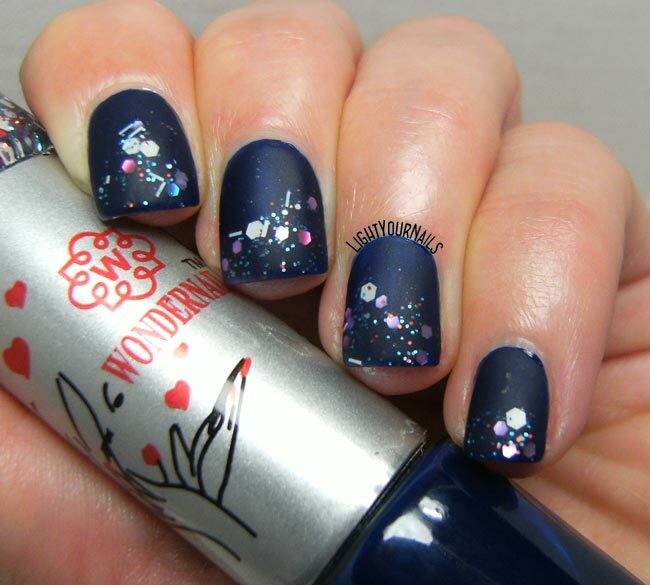 Photos show two coats of blue, glitters on the tips applied using its brush only, top coat. Oggi vi mostro uno smalto doppio firmato Bornprettystore. Avrete già visto in giro questo tipo di confezione, dove da una parte troviamo uno smalto laccato, e dall’altra un top coat glitter. Essence usa spesso questo packaging nelle Trend Edition ad esempio. Qualche anno fa la Revlon aveva lanciato una collezione con bianco da un lato e neon dall’altro invece. L’idea sarebbe ottima, non fosse che la boccetta così fatta è davvero scomoda. 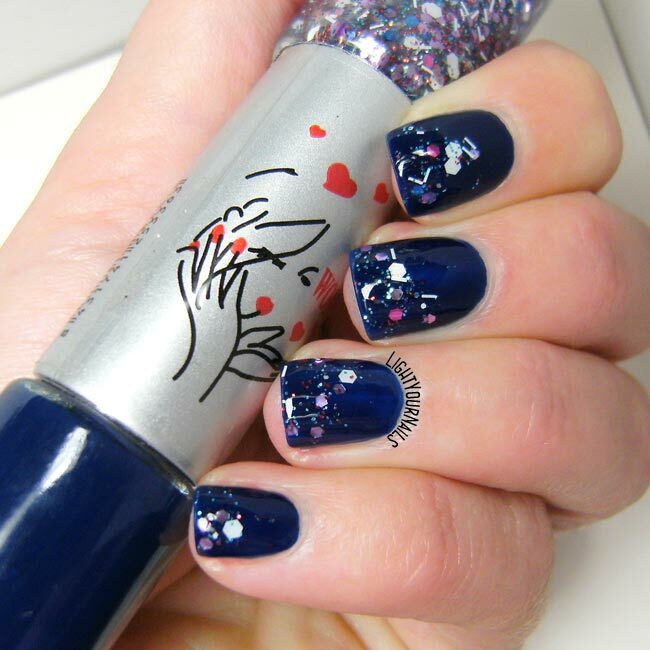 Ma veniamo a questo smalto in particolare: Bornpretty double ended glitter nail polish* nel colore n. 16. Da un lato abbiamo una bella lacca blu cobalto, la cui qualità lascia molto a desiderare. La stesura in sè è facile, ma lo smalto lascia tantissime striature che, una volta asciutte, si trasformano in buchi di colore. Il fatto che asciughi matte poi non aiuta di certo. Bisogna inoltre fare attenzione quando di stende questo smalto poichè è molto pigmentato e risulta difficile ripulire le cuticole dall’eccesso. Il “lato glitter” è un top coat da stendere su tutta l’unghia o solo sulla base o sulla punta, per un effetto sfumatura. Contiene glitter esagonali di due dimensioni, bianchi più grandi, e rosa, fucsia e blu leggermente più piccoli. Ci sono poi dei bar glitter, ovvero dei simil-vermicelli, anch’essi bianchi, e dei piccolissimi glitter rossi e blu. Il tutto in una base trasparente. Il mix di colori è molto bello, e la qualità è decisamente migliore della lacca. I glitter si stendono bene e uniformemente, e non rimangono sgradevoli al tatto (con aggiunta di un top coat ovviamente). In foto sono due passate di lacca, più il glitter steso solo sulle punte utilizzando solo il suo pennello, più top coat. In the photos you can notice the bald spots I was talking about. In the end I added a matte top coat which helped hiding the flaws. I like the idea behind the packaging, you have what you need for a glitter gradient all in one piece. Plus there are so many colour options at Bornprettystore and they are all extremely pretty. However this is not the best choice out there to be honest and I don’t feel like recommending the product. What do you think of double ended nail polish? Do you like the concept? In foto potete notare i buchi di colore di cui parlavo sopra. Alla fine ho aggiunto il top coat Flash Mat di TNS Firenze per nascondere i difetti. Mi piace l’idea che c’è dietro questo packaging, in un solo prodotto avete l’occorrente per creare nail art semplici ma d’effetto. E poi su Bornprettystore ci sono molte altre combinazioni di colore e sono tutte belle. Alla fine però devo dire che si trovano sicuramente prodotti migliori di questo e non mi sento di consigliarlo. Voi cosa ne pensate di questi smalti doppi? Vi piace l’idea? I decided to start 2017 with a green nail polish, which is the colour of the year according to Pantone. Actually 2017 Pantone’s green is called Greenery and it’s not the exact shade I’m showing you today. I wanted a green anyway. 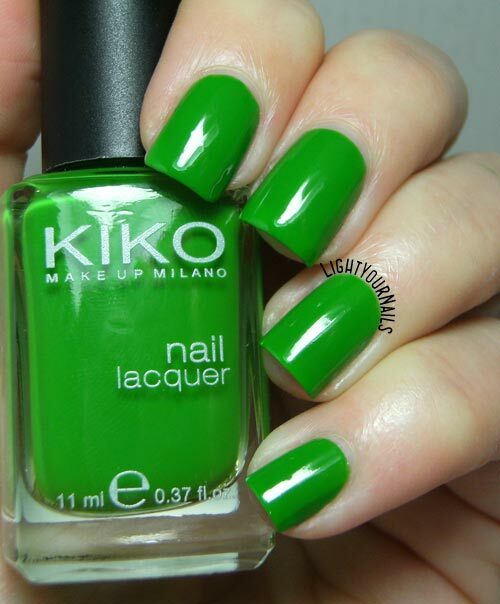 Kiko 391 Grass Green was part of Kiko’s regular nail polish line which is being discontinued unfortunately. The name says it all: it’s a beautiful grass green with a jelly finish. This finish is known for being less opaque than a creme but extremely glossy. Application is very easy and the brush slips well along the nail. Lasting time is not bad either, I wore it for 4 days without chipping. In the pics you see 3 coats without top coat. Per iniziare il 2017 ho deciso di affidarmi al verde, colore dell’anno secondo Pantone. Il colore scelto per il 2017 si chiama Greenery, e non è esattamente la tonalità che vi mostro oggi, ma ho voluto cmq rimanere in tema. 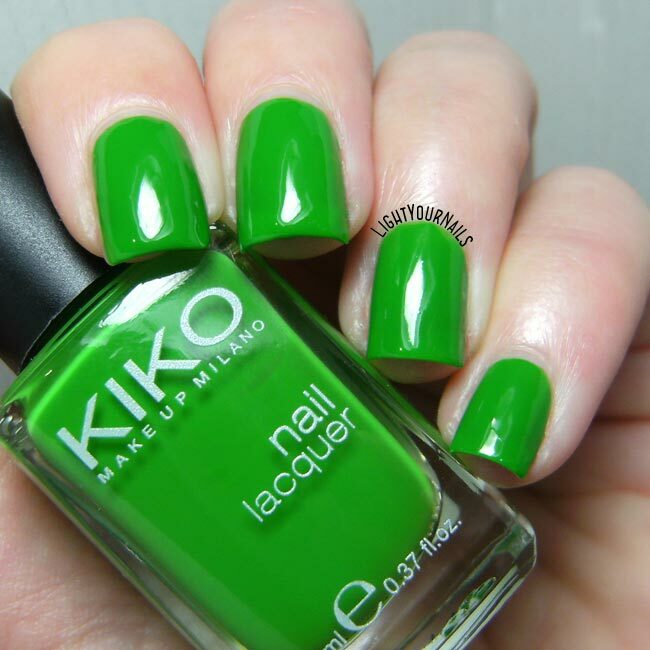 Kiko 391 Verde Erba fa parte della linea di smalti classici di Kiko, che purtroppo stanno togliendo dagli scaffali. Come dice il nome è un bellissimo verde erba, dal finish jelly, ovvero traslucido. Questo particolare finish ha la caratteristica di essere meno coprente di una lacca, ma estremamente lucido. La stesura è semplice e il pennello scorre bene sull’unghia. Anche la durata non è male, io l’ho tenuto quattro giorni senza sbeccature. In foto sono tre passate senza top coat. 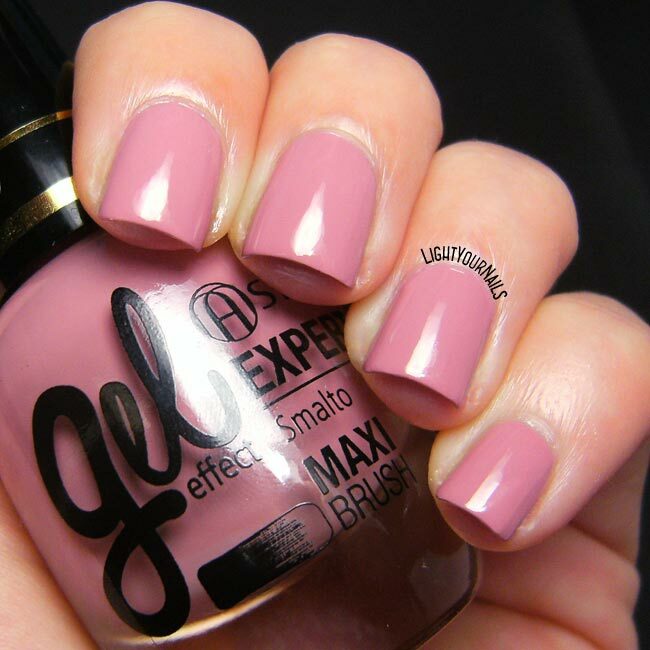 I really like this shade and its finish! 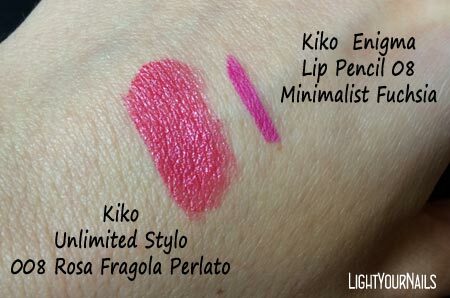 If you happen to find it in a Kiko shop it’s probably on sale so grab it while you can. What do you think of this year’s Pantone colour? Questo smalto mi piace tantissimo, sia come colore che come finish. Se lo trovate ancora in giro sarà sicuramente in saldo, e non posso che consigliarvi di prenderlo se ne avete l’occasione. Cosa ne pensate del colore Pantone di quest’anno?